It is a big day! It is Tyler's Baptism Day! Anytime there is a Baptism in the church is a big day! The two great Sacraments of the Church are Baptism and the Holy Eucharist and we get both today. In Baptism we see into the heart of God, a desire that we might all become God's Children, members of Christ, and inherits of The Realm of Heaven. 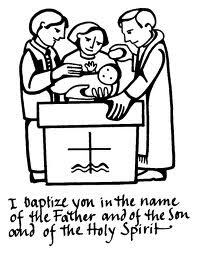 This is, after all, the teaching of our Catechism on Baptism. And the rest of our lives are then dedicated to living more and more Christ-like "day by day". The Collect of the Day, for instance, calls us to "follow daily in the blessed steps of Christ's most holy life." Interestingly enough, the life of Jesus is not built on holiness alone but also on compassion. The holiness code of the Hebrew Bible was built along the axis of a verticle line between ourselves and God, but the life of Jesus was built along a horizonal line of compassion. Jesus requires us to live not only to Love God, but to love one another. The two great lines of Jesus' life meet on the cross, at the intersection between the Love of God and the Love of humankind, and it is there that he was crucified, that he died, and that he rose again, and we believe that he comes again particularly as we seek to come increasingly into daily obedience to his life of holiness and compassion. This is the life into which we are all baptized and which feeds us all in the Eucharistic mystery. These words are reputed to have been recited by the 13th century British Saint, Richard of Chichester, on his deathbed. 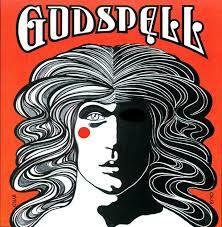 They were popularized by the musical "Godspel" in the 1970's. O dear Lord, three things I pray..."
Like Richard of Chichester, Solomon the Wise chose the way of God over the way of the world. Of all the things he could pray for, Solomon prayed for Wisdom. What Grace to pray such a prayer. Paul continues to reflect on the nature of Wisdom in today's Epistle to the Christians in Ephesus; "Be careful then how you live, not as unwise people but as wise"; and "make the most of the time, because the days are evil." See, Paul must have been watching the news in those days! There were probably nights of violence in Ephesus then as there are now in Boston or in Ferguson or a hundred other cities and towns throughout the land. "So do not be foolish, but understand what the will of God is. Do not get drunk with wine, for that is debauchery; but be filled with the Spirit"
"The hinge of recovery turns on the experience of doing it." "Very truly, I tell you, unless you eat the flesh of the Son of Man and drink his blood, you have no life in you". "But the one who eats this bread will live forever." ~~John 6:58. Did you mention food? Ah, but not the kind of food that has gotten me into trouble. This is the food of God; to do the will of God. As Jesus said "I do not live by bread alone but by every word that falls from the mouth of God". ~Matthew 4:4. This is our experience in the wilderness of Life. 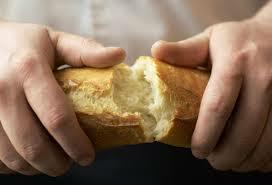 God requiers us to hunger so that we may learn that we do not live on bread alone. Christians in the days of the early church days were often accused of cannibalism and no wonder with talk like this. But heaven is a serious, delightful and joyous matter. When compared to the reality of sin so many fall into. The hinge of heaven turns on the doing of the will of God. It is in the doing of heaven that we dwell in heaven, we dwell in Christ, indeed we dwell in God. It is in the doing of heaven that we come to the Peace that passes all understanding. For heaven is like Wisdom in this: for Jesus as well as for Solomon as well for all of us joined together in Baptim and in the Eucharistic Fellowship these words are verbs not nouns. Heaven and Wisdom are action words. They are not states of being we aspire to when we die. They are states of being we are baptized to live into in the here and now. Baptism and as we do let us sing this hymn; "I want to walk as a Child of the Light". Who Can Exist without God? The collect for the day makes an extraordinary claim. It says that we cannot even exist without God. Digging deeper into the idea, Paul observed in his conversations with the philosophers in Athens, even they knew that it is "in God that we live and move and have our being". ~Acts 17:28. As I see it, our being and God's being are inextricably intertwined, for the further we make our journeys within our own hearts so too we come to the heart of God. This is where our being and God's being meet at the heart of things. Jesus said; "I am the very bread of life". It is as we come to Jesus that all our hunger is satisfied and all our thirst is quenched. Lets unpack that statement a bit if you will. It is Jesus himself who said that it is his food to do the will of God. ~John 4:34. And what might that be good friends? What is the will of God for us but that we Love the Lord our God with all our heart and all our soul, all our strength, all our mind. And to love our neighbor as we do ourselves. By the way, I do hope that you realize that Jesus said that we are to love our neighbors as we do ourselves. This requires that we do love ourselves, and that we treat ourselves with the kind of dignity and respect that we treat anything that is holy. I can tell you from personal experience that learning to do that is a life long project. Especially in the so-called "helping" professions, sometimes the needs of others come ahead of ourselves. Frankly, this behavior is of the essence of disobedience. Jesus said that we are to "love one another as we do ourselves". So then "the Bread of Life" is to "do the will of God". For me that raises the question; "why are we placed on the planet?" "What are we doing here, anyway?" In Celtic Christianity, that question was answered very simply; "Organize your life around the needs the people you live with." St. Aidan of Lindisfarne, also known as "Holy Island" on the northeast coast of England was the center from which Christianity spread in the 5th and 6th centuries. I wondered how did these folks do it? What's the secret to the growth of our faith. And the answer is really quite simple. Organize the church's life around the needs of the people. Aidan started with the dying. To you have a loved one who is dying? Bring them here and we'll take care of them. Then he recruited folks to help him. Do you have loved ones who are sick? 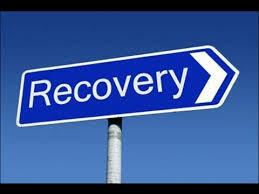 Bring them here and we'll tend to them and nurse them back to health. People began to be drawn to such a place. Do you have children who need to be educated? Or do you yourselves need to know more about farming methods and the current state of knowledge which is another word, by the way for "science". Come here. We are among the best scholars in Europe. While the rest of Western Civilization sank into the Dark Ages, the Celts kept the bright light of Civilization burning. Who would not be drawn to such an enterprise? 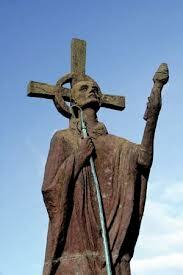 By the way, the Celts brought this method of Christian Evangelism to all of Western Europe. Ah, but they didn't stop there. The Celts had more to offer than these very basic and essential responses to human need. For instance, are you discouraged by life's drudgery? Are your hearts downcast? Are you just plain depressed? Come here and we will cheer you with the merriment of good and cheerful company. After all, they were good cooks and were well known for making some of the finest brew known to those born of woman. Not enough? Still not happy? Perhaps you feel lost in a universe as you stare into a starry sky at night and wonder about your place among the starry host. We have good news for you. There is the story of a Child born in Bethlehem under one of those stars. He is The Child born to the maker of all Heaven and Earth. And when he grew to become one of us, he became the very essence of the love that Creator intends us to know. He is the Love God made flesh and blood. And he died for us so that all our sins might be forgiven and moreover so that we might never again be afraid of the universal fear of death, the kind of death that snuffs out hope. Now as we stare into the heavens at night our hearts may be filled with the knowledge of God as the waters cover the sea. Still not quite enough? Come to the Church with us. Come and be Baptized into that life! gather with us Sunday by Sunday as we break bread together with this very God, because we have come to know that he is the Bread of Life. All who come to Him will never be hungry again. All who believe in Him will never thirst again. He is moreover the Bread that comes down from Heaven so that those who eat of this bread will never die, but have instead a hold on eternal life. I cannot think of a sorrow deeper than the sorrow of one who loses a child. Like David did with the loss of Absolom, his third child, a handsome and swaggering son, a rebellious child who sought to overthrow his father, still when fortune overtook him and he got caught up the the branches of a mighty oak, he met his end at the edge of a sword. No one had the courage to tell the king but the Ethiopian slave, the "Cushite" and David made lamentation. "O my son Absolom, my son, my son Absolom. Would that I had dies instead of you. Oh my son, my son Absolom." In this exquisite Hebrew poetry, David calls out from the depths of his soul. Ironically the name Absololom literally means "Father of Peace". When David held the baby in his arms, that was his Dream; and that the Dream would come to this. God had a Dream for his Son too, and God knows too what it is like to loose a Son. God still has a Dream for his Church. Perhaps like the Celts we might be like the church of merry old England. Perhaps we might be like those who organized themselves around the needs of all those around them. In community organizing circles, if you wish to organize folks you begin with the leadership of the community and through a series of systematic interviews, you identify those in positions of public trust. What are the needs you see out there. You interview the members of the church. What are the needs you see in the church and in the community. What are your concerns. Just as I ask the question, I begin to hear the stories of the church; the many blessings as well as the stories of hurt. The joy as well as the anger. The stories of the people, the clergy, the bishops; just as I can tell you stories of all the people, the clergy and the bishops it has been my joy and otherwise to know and love. But above all, you can hear the stories Jesus can tell of what the church did to him; the Sadducees, the Pharisees, the Lawyers and the Scribes; we know what they did to Jesus. And the stories Jesus tells us we now know as the Gospels. They have become the Good News. Far and away, by far and away, the blessings of this life outweigh all sorrows, but those sorrows, and somehow we seem to hunker down and focus on the sorrows, just as we do on the Cross of Christ. How do we move forward? 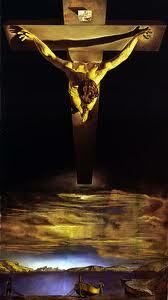 The answer is in the very Cross on which Jesus was crucified, since the cross is the Way, the Truth and the Life. It is in that Cross that we come to know the Dream of God. Without the Dream of God in our hearts this is impossible. For we are the Jesus of God's Dream. We are the Body of Christ. We are the Absolom; the "Fathers and the Mothers of Peace". And we cannot exist without God, for it is in God that we live and move and have our being. Jesus is the very Bread of Life and once we organize our lives around the needs of all humankind, God's Dreams begin to come true. As Jesus said, this is my food; to do the very will of God. Otherwise we merely exist. We cannot really exist without God. 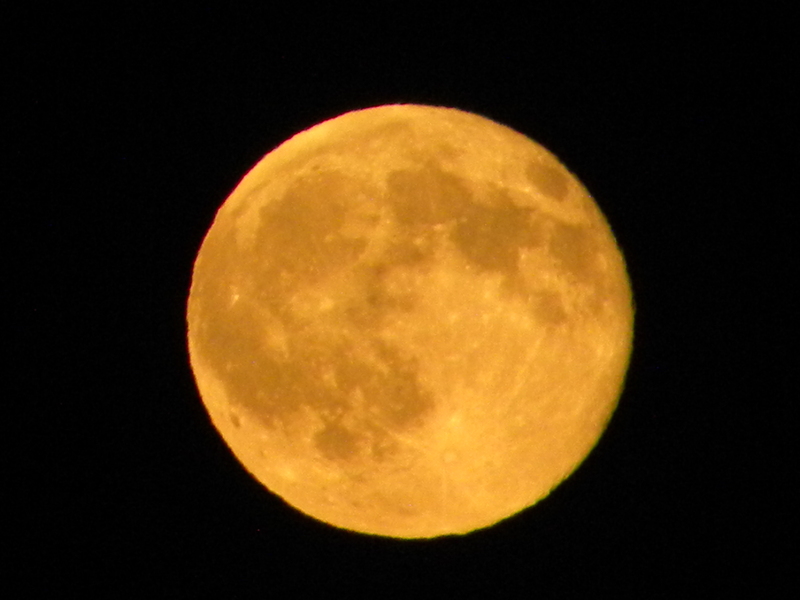 The moon was magnificent on Friday July 31, 2015. I cannot help but stand in awe of such events as these. Here are some reflections on that glorious moment, 8:03pm at moonrise. It is a rarity but it does happen. Once every 30 months astronomers tell us. The reference is not so much to the color of the moon, although Friday night's moon was magnificent and changed in hue from red, to silver and to bluish/silver depending on how long you watched it. In fact a true "blue moon" appears blue only when there has been an event like a volcano somewhere on the planet. I got some fairly good shots of the full moon from my vantage point at the Boardwalk in the evening as the sun set in the west and as the moon rose in the east. There were all sorts of folks watching down by the marshlands from the parking lot to the footbridge to the beach. The reference to the Blue Moon is to the occurrence of a full moon twice in one month. The last full moon was on July 2, this one on July 31st. The next Blue Moon will not occur until January of 2018.
and the firmament shows God's handiwork. the children of humanity that you should seek us out?" 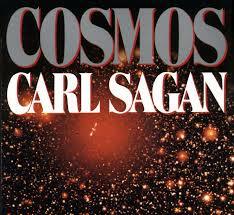 I know my astronomy and God knows I know and love Carl Sagan for what he did years ago to educate us in the magnificence of the cosmos with its billions and billions of stars and galaxies, its dark matter and its black holes and so many other wonderful imponderables. I find that it is the truth of science that inspires me to appreciate the poetry and the mystery of all space and time. For to me, existence itself is a creature of God. To say that God "exists" doesn't quite hit the nail on the head because God, to me transcends existence. The mystery of God is in of the Being of God, as well as in the being of humanity. It is in our Being that we are connected in the deepest places of the human heart where God's heart meets ours. 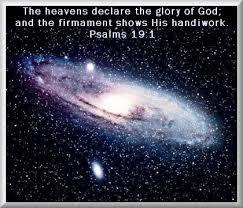 Science is no threat to our knowledge and appreciation of God and God's creation. Science provides the basis of truth that enhances our appreciation of the magnificent complexity and detail of the universe. We grow to grasp something of what space and time are as their intertwined reality turn about on each other. 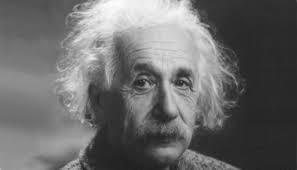 Einstein had a marvelous appreciation for the relationship between science and faith. It was he who once said of both; "Religion without Science is blind, but Science without Religion is lame." Science cannot even walk without an appreciation for the wonder and mystery of existence and life. "I therefore, the prisoner in the Lord, beg you to lead a life worthy of the calling to which you have been called, with all humility and gentleness, with patience, bearing with one another in love, making every effort to maintain the unity of the Spirit in the bond of peace. There is one body and one Spirit, just as you were called to the one hope of your calling, one Lord, one faith, one baptism, one God and Father of all, who is above all and through all and in all." In this period of transition, I believe God is calling each of you to consider how you might be part of building up the Body of Christ in this place. What do you bring to this faith community? What gifts can you share? How is God tugging at your heart? And to do what? Moreover God is calling us to be someone for each other. We are to be One, "bearing with one another in love". We are called to be Christ for the world and to organize our lives around the needs of the community in which we live. Jesus noticed that the people were hungry in the Gospel. Wishing to respond to the immediate need, he instructed the disciples to respond to the hunger of the people in the immediate vicinity. And then he encouraged us to remember that we hunger for a great deal more than the food that perishes but for the food that nourishes us to eternal life. Let me tell you this, as you live out your lives as a congregation in this manner, you will become a beacon to the whole community and many will be drawn to you. And yes, one more thing; as you search your hearts and souls for who might be your next priest, so too you will also search your hearts and souls to discern how God is calling you to be involved in building up the Body of Christ as St. John's Church. When your new priest comes, there will be a new burst of energy and excitement. What I pray for then as I pray for now, is that each of you will want to say from the bottom of your hearts, "You can count on me to do whatever needs to be done to strengthen the vitality and vigor of this congregation." This discernment is as important if not more so than the discernment of who your next priest will be. God will also call you to be a prophetic voice, in the way God called Nathan to speak the truth to David, you will also have something to say to the world about how it treats the poor, the suffering, the vulnerable. You will be called to courage on behalf of those who have no voice. You and I are always called to be the voice of the voiceless. Once in a Blue Moon, we have this opportunity; a time between priests, a time to search our souls as well as the souls of those we search to become the next rector of St. John's. It is the good old summertime. Take the time my friends to pray.